Plus red velvet paper from my stash and Fiskars small heart punch. Love this, Tracy! Your embossing adds so much to this card, yet keeps it CAS! Fabulous! So glad you could play along! CAS perfection...love this one Tracy! 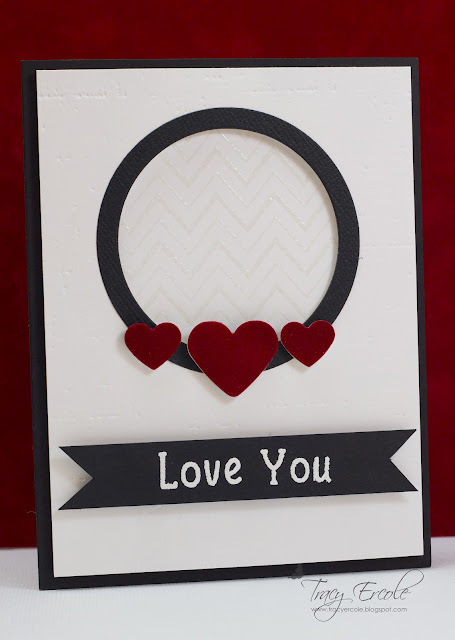 Tracy - I love how CAS this is, and I especially love the subtle chevron inside the circles. Thank you so much for playing along with us at CAS-ual Fridays! This is really cool! Love the subtle pattern and bold colors. Thanks for playing with us at CAS-ual Fridays, the Clean And Simple challenge!